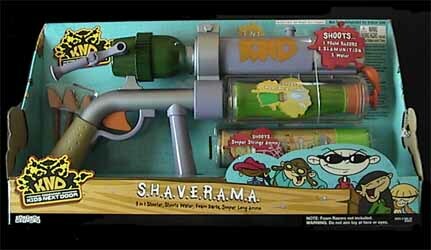 S.H.A.V.E.R.A.M.A. (Shoots Heckuv Alotta Very Electric Razors And Multiple Armaments) 3 in 1 razor rifle is designed to shoot water, foam razors and S.L.U.M.U.N.I.T.I.O.N. (Stringy Long Ammo Most Usually Needed In Totally Important Operations Now). By the way, have you started to notice a pattern here? Really terrible acronyms? Not only do these toys intentionally look like they are the brainchild of a group of 10-year-olds, but they are also given names that only a juvenile could think up. There's also a handy suggestion on the back of the box: "Filling with soda, milk, juice, gravy or baby oil is NOT recommended". Baby oil! Now there's an idea for a party!